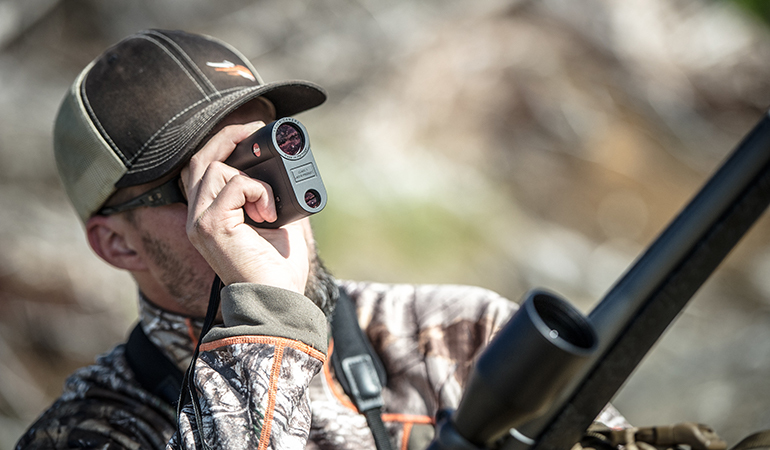 A laser rangefinder is a significant investment for a hunter, costing several hundred dollars depending on the brand and the capabilities of a specific model. But how do you know which unit you need? Are you buying more rangefinding power and less precision than you require? Which attributes are the most important when selecting a rangefinder? And how do they differ between archery and rifle modes? Bear hunting adds even more variables. Bruins often live in thick cover. Their dark fur soaks up light, and lesser rangefinders are often challenged to read a black bear in low light. The truth is rangefinders are as variable as any traditional optic, but because electronics introduce a whole other level of capability, here are some qualities to consider if you’re in the market for a laser rangefinder. There’s an arms race of sorts to extend the demonstrated range of units. Many new models have advertised ranges of 2,500, 3,000, and even out to 3,500 yards. Typically, the advertised range of a unit is the maximum distance at which the rangefinder will “read” targets, but manufacturers fail to note that these ranges are based on highly reflective targets. Think a highway sign or the metal roof of a distant barn. But hunters want their rangefinders to read less reflective targets, such as the hair of a distant bear or the confusion of leaves or tree limbs. Or, often even more critically, a bear behind a screen of leaves. Unfortunately, many of these rangefinders won’t range a deer beyond 1,000-1,200 yards. One way to test the sensitivity of a laser rangefinder is to range bear-sized objects clad in various surfaces at a wide variety of distances. Try ranging a moving car, or a bear-sized bush. If you can get consistently accurate readings on the full range of targets, that’s a model worth considering. If you’re in the market for a rangefinder that must handle archery hunting, see how close it will range. It should return results at a precision of less than a yard inside 20 yards. Next, range targets both in full sun and obscured by shade. One critical operational difference between rangefinders is the sensitivity of the processor and the quality of optical coatings that filter the laser signal from the ambient noise created by infrared radiation of sunlight. In order to test the real-world capabilities of a rangefinder, say at a retail establishment, ask to take a test unit outdoors and range various targets in all light conditions and distances. One reason rangefinders fail to detect targets—or more accurately, fail to identify a target surrounded by visual clutter—is the imprecision of the laser beam itself. Think of the beam as a cone of light, almost like the visible light emitted by a flashlight. While lasers have a much more tightly focused beam than a flashlight, the principle is the same: a more focused cone can pinpoint individual targets more capably than a wider, more diffuse beam can. This is called the “beam divergence” of the laser. The smaller this divergence, the smaller the target the unit can range precisely. Leica’s laser rangefinders, for example, have one of the smallest beam divergences on the market, measuring just 1.2 milliradians wide by a half a milliradian tall. The horizontally oriented rectangular shape of the beam is intentional; it’s designed to better read targets that are wider than they are tall – like a broadside deer, for example. Other brands may have wider beam divergences that are circular or square, but the horizontal rectangle allows a hunter a greater chance to put the laser beam on a bear-shaped target, and not elsewhere, such as a rock in the foreground or a tree in the background. Most hunting rangefinders are calibrated to find the second-priority image in any given targeting situation. What does that mean? It’s easiest to explain using the example of golf rangefinders, which use a first-priority image system. 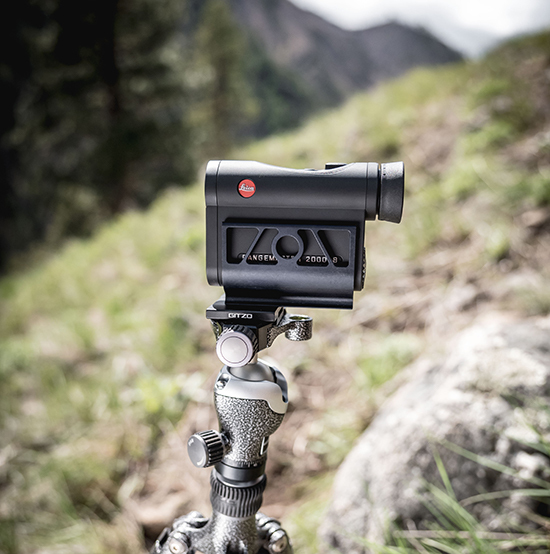 Most rangefinders don’t detail their targeting priorities on the box, so it’s useful to check with a store clerk or research the product online. But, generally speaking, hunters will not want to simply repurpose a rangefinder designed for golfing. Some higher-end rangefinders allow users to select the ranging priority to fit their specific needs. One of the most influential determinants in rangefinder selection, you can find units for under $100 and others for over $1,000. So what are you actually buying? Electronics are only a relatively small part of the cost. 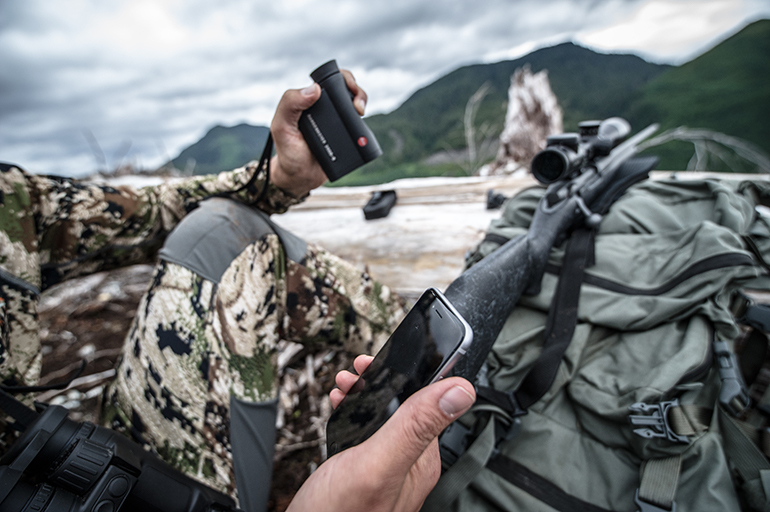 Most laser rangefinders use Class 1 modules, which are eye-safe and have enough power to handle most hunting scenarios. Processor speeds—or the amount of time between when you push the ranging button and when you get a readout on the digital display—represent a wide degree of variability. It’s the processor speed and software that will help define the sensitivity of a unit, or whether it is capable of ranging mainly reflective targets or targets with a high degree of variation. Another difference from one brand to the next is the optics that allow you to see the image in the first place. In addition to the glass inside the unit, the type and performance of the display is also a point of differentiation between brands. Do units display range and other information in liquid crystal display (LCD) or light-emitting display (LED)? Eye relief, field of view, and the ergonomics of the unit—not only how it fits your hand but also your face—are important considerations. Lastly, consider the style and design of the reticle, or the specific aiming point that you use to range objects. Many rangefinders are built to display line-of-sight distances but also angle-compensating distances, the difference being that when it comes to ballistics, a bullet (or arrow) can be closer depending on the steepness of the angle from the gun or bow. Many rangefinders use what’s called the “Rifleman’s Rule,” or simple Pythagorean geometry, to determine the angle-adjusted difference. But it’s worth paying more for angle compensation that’s based on ballistics data, which has a much higher degree of precision and can be matched to the specific weight and velocity of your projectile, which are loaded into the on-board processor. Finally, consider a unit’s close and far angle-compensation capabilities. The best feature archery-friendly ranging and angle-compensation from 10 yards to 100 yards in simple archery mode, but rifle-shooter optimization from 100 to out past 1,000 yards.